Watch this video trailer created by Peter Ruocco for the 2016 Shotgun Players production of HAMLET. Read the American Theatre magazine online feature article about The Shotgun Players' HAMLET. "A mind-bending new production... Refreshing... The actors’ ability to pull off this Hamlet is simply awe-inspiring. And the format makes you examine your preconceptions of both the play and the nature of theater: All lines of gender, age and race will be crossed at some point." "Uplifting and weirdly affecting... You immediately notice that there isn’t a conventional Hamlet in the cast. They are a wonderfully eclectic bunch: men and women, a smattering of ages and races, and, if you follow Bay Area performers, even different acting styles... We are plunged into a democracy of infinite possibilities... A unique and rich response to the play... We should be thankful to witness such a circus of daring." "One of the most exciting ways to present this famous Shakespeare tragedy... An amazing accomplishment..."
"An exciting and evocative way to experience a play that most theater-goers are already more than familiar with, not to mention an intriguing look inside the play itself... A master class in both flexibility, and in the lyrical malleability of Shakespeare's words..."
"One of the best Hamlet’s I’ve ever seen... Jackson’s vision is to view Hamlet itself as a sort of 'play within a play' in the lives of the actors performing it, and, by extension, in our own lives, and, as such, a kind of improvisation on the vagaries of fate... A cut-to-the-bone carnival Hamlet that packs one hell of a wallop... The invention seems endless... This is some of the smartest theatre I have ever witnessed... A masterpiece in every sense of the word. See it, and get your boasting rights!" David Sinaiko (L) as Gertrude and Beth Wilmurt (R) as Hamlet. 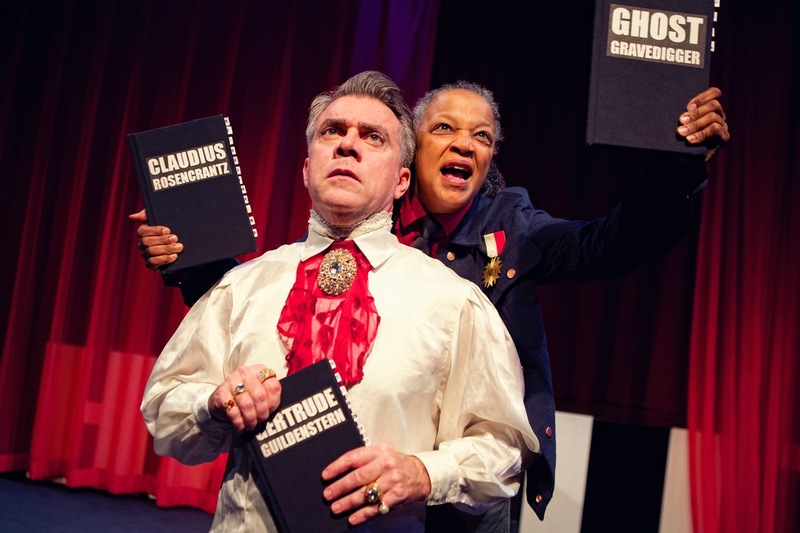 Megan Trout (L) as Gertrude and Kevin Clarke (R) as Hamlet. Kevin Clarke (L) as Gertrude and Cathleen Riddley (R) as Hamlet. "A Hamlet that surely will become the talk of the town, if not the entire American theatre world – not only because of its innovative, risky casting methodology, but also mainly because of the incredibly powerful, engaging, and heart-pumping result... Incredibly innovative and insightful... Nothing short of brilliance can be used to describe what Mark Jackson has accomplished." "Jackson’s staging is clean, and in his signature style, very physical... The work is raw, rough, and unsentimental. [The] audience is called upon both intellectually and imaginatively to extend the performance far beyond what is materially presented in front of them... This is not 'gift shop Shakespeare.' It is not pretty, celebrity studded, or made topical. Jackson and his cast are excavating the essential text from under a lot of accumulated baggage, and what emerges is often highly original and gut wrenching." "Absolutely terrific... Director Mark Jackson took a huge risk here, and maybe the tightrope-like conceit added necessary excitement and unfamiliarity (not to mention a little panic, surely, in the actors). But the staging and clarity of this Hamlet transcend any theatrical stunt and polish Shakespeare’s old yet ever-relevant chestnut anew... It is a testament to Jackson’s direction that even the tiniest parts hold weight... I left eager to see the play again." "It's a daunting premise, but one that the cast of director Mark Jackson's Hamlet pulled off with wild success... By opening up Hamlet to thousands of possible casting combinations, Jackson inevitably defies traditional assumptions about the gender, age, and race of the play's well-known characters. Rather than hampering the performance, this spontaneous diversity seizes upon the universality of Shakespeare's work in a way that many other productions fail to — fully revealing the kernels of common humanity within each character... Shotgun Players' Hamlet is an exhilarating journey, and one that manages to stoke the audience's appreciation for the very mechanics of theater while its powerhouse cast brings new vitality — and vigor — to a well-known play." "Ingenious... [An] extraordinary version of Hamlet... The production is tightly directed by first-rate Mark Jackson..."
When a play is so widely familiar and beloved as HAMLET, its beloved familiarity can become a burden to those who hold it dear as well as those who feel left outside its hallowed walls. Familiarity obstructs our individual and collective views of what else beyond our preconceptions might come of the play. The endless flood of diverse possibilities pouring out of HAMLET might be far more interesting, surprising, and entertaining than any single vision. And so all seven actors in this production learned every role. Just before curtain time each night, they lined up on stage in front of the audience and drew their roles out of Yorick's skull. They had five minutes to get dressed and then bam! Showtime! Our aim with this production was to create – each night! – not the HAMLET, but a HAMLET that wasn't about how clever the star playing Hamlet would be with the famous lines and tropes. Rather, we hoped to share a HAMLET that embraced every one of us gathered in the theater on a given night, in all our contradictory, various, and evolving states of mind and body. Hamlet is someone's child, friend, and lover. A poet, actor, politician, philosopher, athlete, and student. Suicidal and life affirming. Prone to shortsighted decisions and uncommonly insightful observations. Why not let all these Hamlets share the stage? They were all in the house, after all! 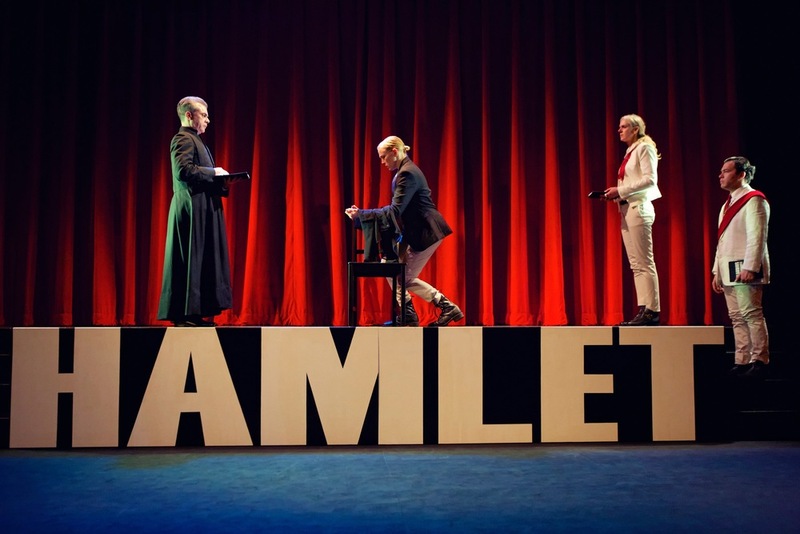 And why not create a production of HAMLET that may likely go off the rails at any moment – just like the characters in the play do, and just like our own lives occasionally do? There is courage to be found in facing the threat of failure. Named "Best Theater Production of 2016" by the East Bay Express: "Races, genders, orientations, and ages mix, match, and defy preconceptions... This is Hamlet as Rorschach test and roller-coaster ride in one." A 48 Hills "Best of the Bay 2016" Editor's Pick: "The deft production transcended gimmickry with a diverse and excellent cast, giving us a completely new, completely random Hamlet every night to chew on."